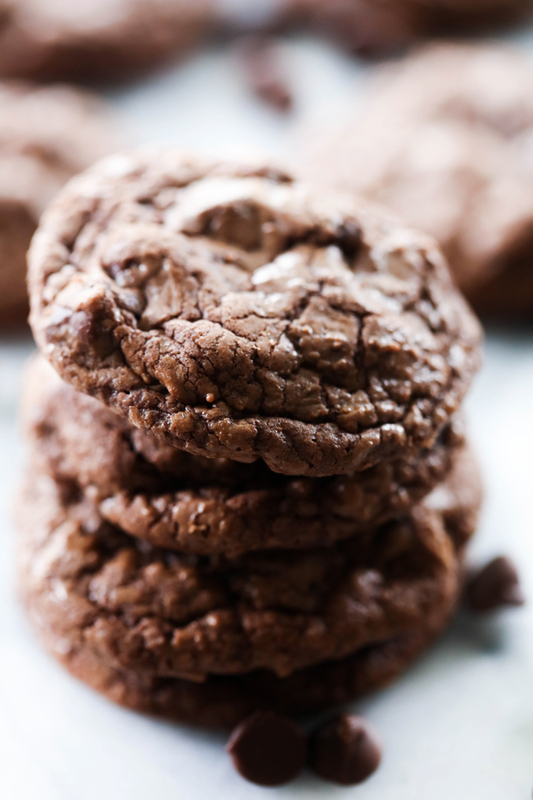 These Soft and Chewy Double Chocolate Cookies are rich, delicious and LOADED with chocolate! With a chocolate cookie base and chocolate chips this is truly a chocolate lover’s cookie. They taste like a brownie in cookie form. Chocolate is my happy food. I love it in all its varieties. I have been wanting a cookie that tasted like a brownie and here it is. This will be one of the most soft, chewy and moist cookies you will ever try! It is loaded with chocolate and has a rich and delicious flavor. If you love chocolate then you absolutely need to try these Soft and Chewy Double Chocolate Cookies. They are truly a chocolate lover’s cookie and are absolutely fantastic! 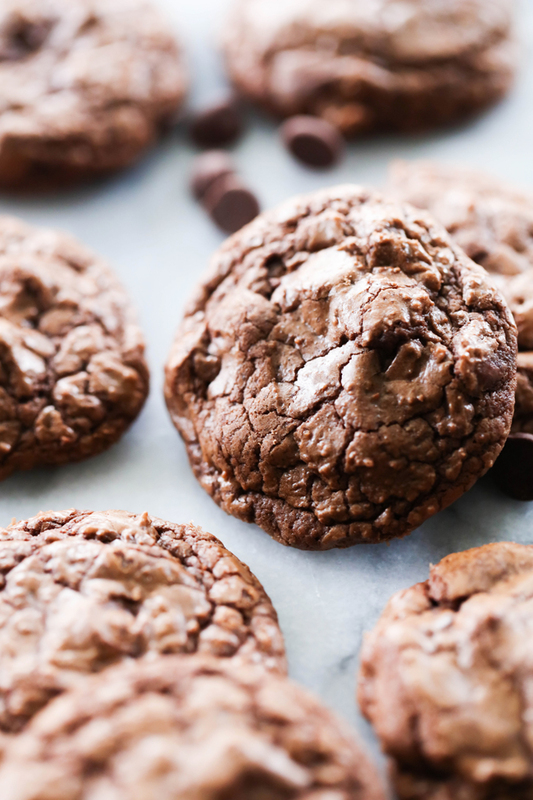 These Soft and Chewy Double Chocolate Cookies are rich, delicious and LOADED with chocolate! With a chocolate cookie base and chocolate chips this is truly a chocolate lover's cookie. They taste like a brownie in cookie form. In a microwave safe bowl, melt baking chocolate in 30 second increments, stirring between each increment until melted and smooth. Let cool. Line cookie sheets with parchment paper or spray with cooking spray. In a large mixing bowl, beat butter, brown sugar, and sugar until creamy. Add eggs and vanilla and beat again until smooth. Add cooled melted baking chocolate and stir until mixed completely. Sift flour, cocoa, salt and baking powder together and add to butter and sugar mixture. Mix until just blended. Do not over mix. Let dough rest for 10 minutes. This allows dough to set up. Place dough on cookie sheets in 1 inch to 1½ inch balls, about 2 inches apart. Cool cookies on baking sheet for 2 minutes. It allows the cookies time to set up. The baking chocolate isn’t in the instructions. Should it be melted & added to the dough? So sorry about that! I can't believe I missed that. It is added to the instructions now :) Thanks for catching that! This seems delicious and I can’t wait to make it! What do you do with the baking chocolate? Do you melt it over a double broiler? So sorry about that! I can't believe I missed that. You melt it in a microwave safe bowl. It is added to the instructions now :) Thanks for catching that! Hello, these cookies look AMAZING!! I just have a question. This recipe calls for cocoa. What kind of cocoa? Are you saying unsweetened or sweetened? I would love to make these. Thank you for sharing! In this recipe, I don't see the directions for what you do with the 10 oz semi sweet baking chocolate.